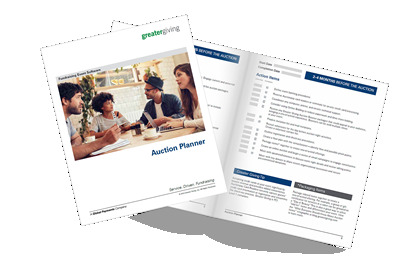 Your Auction Planner is available for download here. You can come back to re-download the planner at anytime. Best of luck at your event! RAISE MORE AND STRESS LESS! No more stressful fundraising events. Speed up check-in and check-out. Improve the event experience for staff, volunteers, and donors. Take online donations year-round. With Greater Giving, you'll have everything you need to pull off your best fundraiser yet. Knowledge and experience gained from tens of thousands of events in one, easy to follow planner! WHAT'S IN THE AUCTION PLANNER? Everything you need to make your next fundraising event your best event! Valuable insights from tens of thousands of successful events providing the knowledge and experience of what really works broken down into simple and managable steps. Full list of action items including those often overlooked items!